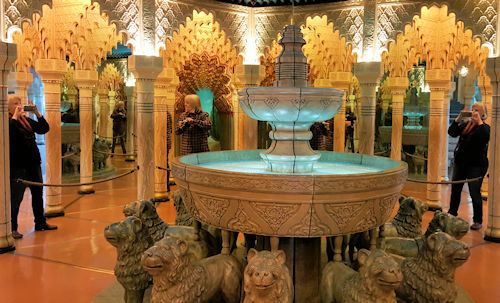 Remember the thrill of winding through a mirror maze when you were a child? 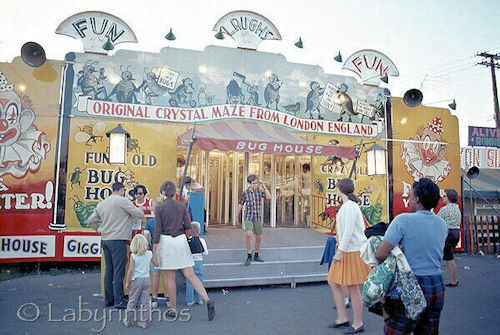 This (old) picture looks so familiar to me; I remember going to the Napa Town and Country Fair with my family every year, and these mirror mazes were always set up somewhere along the midway. I guess it really dates me to say that I remember the fashions, too. This particular photo was taken at the 1968 Michigan State Fair in Detroit, but it captures the timelessness of the attraction of mirror mazes. Each with its own theme (this one clearly featured the world of bugs), this crystal maze didn’t really come from London, England at all. These post-WW2 portable mazes were actually manufactured by the National Amusement Device Company in Dayton, Ohio. When was the last time you let yourself feel your way through the crystal paths? I have to admit that they are probably my favourite type of maze, as fun to photograph as they are to solve – this is a trick shot of the two of us playing in the historic Gletschergarten in Lucerne, Switzerland in 2015… but that’s a story for another day. The new and improved Labyrinthos website is getting closer and closer to completion, and we hope to launch it by the end of March. These photos will feature in one of the many articles that will be available in pdf form for personal use.